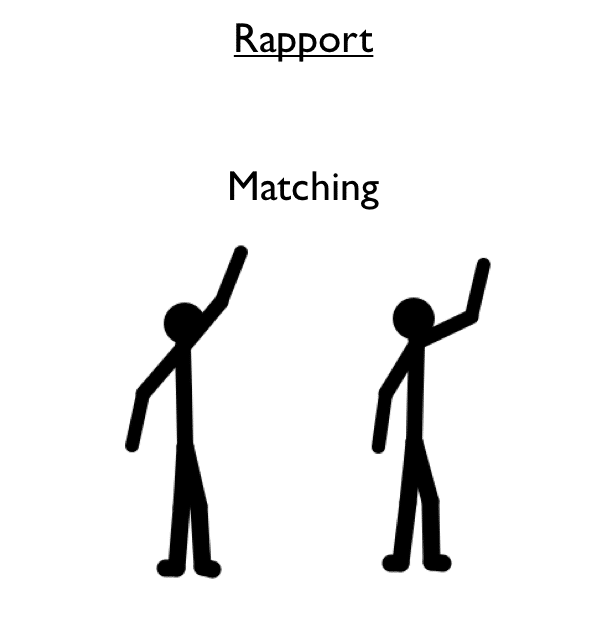 Matching is exactly replicating another persons movements in order to gain rapport with them. Eg one person raises their left hand slightly. You match them by raising your left hand slightly. Even from when we are young children we learn to match other peoples behaviour, we do it naturally. Have you ever heard a bunch of children talking. They all talk at the same speed (normally frantic), and the voices get louder and louder as they match each other. They are in rapport. They have an energetic connection with each other, they like each other. As adults of course we retain these unconscious skills, and with people that we know and like we will immediately get in rapport with them, talking about common interests, using common words, acting in a similar way and generally matching them. When you meet people for the first time, or people who you are not necessarily familiar with then there can sometimes be a bit of awkwardness in the communication. This awkwardness is due to the fact that you are not yet in rapport with them. You can make sure that you get in rapport with anyone that you meet by following the NLP process of building rapport. One of the ways to build rapport is to match other people’s behaviour, breathing, the words that they use, their tone of voice, the speed of speech etc. This is part of the Building Rapport section of our NLP Practitioner Training Course. We share with you exactly how NLP matching works and how to build rapport easily and effortlessly.